We've already discussed an important skill in how to use a compass and that is determining your heading. Point the direction-of-travel arrow straight ahead in the direction you are going, turn the compass dial until RED is in the Shed, and read the heading at the Index Pointer. If you turn and face two smaller rock formations farther off in the distance, which of the following bearings would be correct? In this case, since you are facing northerly, a turn to the right will be more to the East so #1 is correct. It is important to keep a feel for general directions in your mind. If it's early morning and the sun is in your face, you are heading east with north on your left and south on your right. Remember, right and left are relative to your current heading. If you're in the northern hemisphere and the sun is at your back, you are heading in some northerly direction. In the southern hemisphere, the sun at your back means you are facing southerly. Learning how to use a compass to follow a line of travel is simply pausing to take a reading occasionally while hiking. In the picture below, you're trying to find your way to the lake in the distance to refill your water supply. 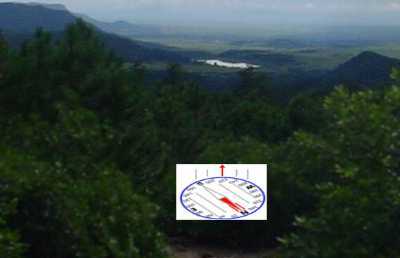 In this opening in the forest, you pause to take a bearing to the lake and see that it is about 220 degrees. Ahead of you, there is no trail and you drop into thick forest. You won't be able to see the lake or easy landmarks for quite awhile. 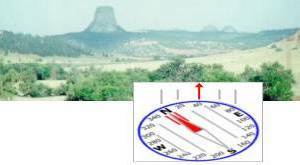 As you walk, you need to occasionally check your heading on the compass to ensure you are still heading 220 degrees. 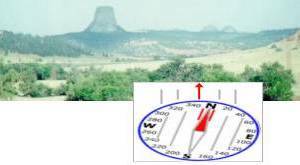 You now understand how to use a compass to read your current heading and to take a bearing to a distance landmark. 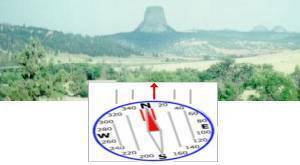 Using a compass in this way will guide you over terrain that you are acquainted with or if you know the general directions you need to travel before hand. But, for new territory, you will also need to know how to read maps and use a compass to guide your way. A hiker was hiking along one day when he came to a wide river. Seeing another hiker on the other bank, he called out, "Hey, how do I get to the other side?" The second hiker looked slowly along the bank to the left, then along the bank to the right, thought a bit, then called back, "You ARE on the other side!" Thank you for this important information that everybody should know, especially kids. I just bought a simple, steel compass, and I love it. I decided to play around with it and came on your site to touch up my compass skills since I hadn't used one since I was a teenager. Thank you for your knowledge on such an important survival device. Using a Military Prismatic Sighting compass, How do I put the red in the shed? It does not have any red marks. @David - As mentioned above, one end of the floating compass needle is usually red. If it's a different color, then use that instead of "red" in the shed. The "shed" is the two parallel lines making the Orienting Arrow on the floor of the compass housing - they can be red, or a different color.